This article appeared (edited, and in Dutch) for Noisey, here. It’s nearing midnight and I’m standing outside the Multiplex near Leiden station, looking down the street. I’m slightly pissed. Inside US punk legends Millions of Dead Cops growl and rumble on, bringing their set to a close. I stand talking to a few old friends and think, ‘that’s it. No afterparty for me’. I pat the wooden door of the SUB entrance a last time. I then trudge home, full of Schutters (or Schultenbrau) beer. It wouldn’t be fair if we didn’t mention the last gig. 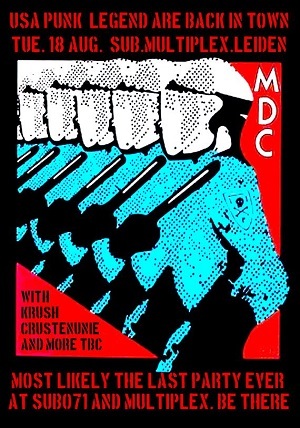 Two acts that embodied SUB’s “less is more”, “can-do” attitude play tonight alongside MDC. First up were Crustenunie, classic Leiden crustcore; energetic, committed squat missionaries who assault the crowd with their energy. Ramones-like, they hardly give themselves a break. Kru$h ramp things up further with a brilliant show, committed, angry and funny in turns, driven by the harsh croaks and growls from their twin vocal attack. Their tracks crash out, the rumble of bass and guitar and drums melting into each other at times. Both bands have members who have worked as bookers, or roadies, or band hosts, and on the sound, door, lights, and backline for the venue. It’s only fitting that they play. They should take all the applause. All through the night, I spend time reminiscing with others about old gigs here. This place hosted some incredible acts, from Denmark, Chile, Serbia, Israel, Italy, the UK, Argentina, America… Deerhoof and Common Eider’s Rob Fisk wanting to play louder, getting carried away with the vibe; squashing one complaint with, “No man, it’s not loud enough!” The remarkable anarchist-situationist band, Gul Night Out attacking the audience with a pair of red knickers, and a pair of dustbin lids (or were these two different gigs?). Las Kellies playing to a load of posh Brits (where did they come from?) A crazy, sweat-drenched, euphoric Monotonix show (maybe two). The drummer from the Christian Family Underground wearing a gold Bacchus mask, looking like something out of Caligula. Watching Samuel T. Herring from Future Islands do his whole routine in front of about 20 people on a miserable winter’s night. The stoned midnight to 3am trip of Denmark’s Øresund Space Collective… Big Ups and Go!Zilla nearly shaking the building down. Bob Corn holding everyone in the palm of his hand with a whispered folk show. The swathe of fabulous noise, crust and grind shows here; too many to mention (but the bands always seemed to be from Central Europe)… Israel’s TV Buddhas bringing their snaky cool to SUB, in one of the hottest shows on record (the drummer nearly fainted). British acts Morton Valence and Electric Soft Parade putting on brilliant pop shows; Daniel Land and the Modern Painters, Air Cav, and Calvin Party bringing a slice of Manchester’s underground to SUB; and the remarkable night when The Membranes, Las Kellies and Repetitor played upstairs in the Multiplex to a bunch of academics from a law conference at Leiden University… WHAT a night that was. The sight of uptight law professors taking selfies to the screaming noise of Repetitor and the space punk of the Membranes… Oh yeah, Repetitor’s gig in SUB itself. THAT was one of the greatest rock and roll shows of all time. A Ragnarok of the senses. My all time number 1. SUB071 was also a breeding ground for Dutch bands, and a significant factor in the beginning of that Dutch underground marketing fad a few years back. In fact that whole Dutch underground moniker was probably invented in SUB. The place hosted release shows, and warm up gigs, and try-outs for many who would later be picked up, many who needed time to work things out. Spilt Milk, Tijger Salto, Spoelstra, Danny Ramires, Rats on Rafts, Space Siren, The Sweet Release of Death, WOLVON, Naive Set, No Future Kids, Spoelstra, Kattadreuffe, the Shaky Maracas crew, Yoshimi, My Vanity Project, AC Berkheimer, Rooie Waas, Appie Kim, Deze, Sugar Coated Mindbombs and Jullie Mittens, Droppings… I really could go on and on and on here. Basically SUB put on shows for them when many other places wouldn’t have bothered. The early shows were very basic; no stage, under glaring spotlights, and no velvet curtain on the wall to dampen the feedback. In fact you got a shock if you leaned against the wall. And who can forget the lake, and the sandpit out of the back of the venue, before the gemeente turned the space it into a bike rack. But those shows were beautiful and looking back it hurts to think just how everyone thought the place was a temporary place, a solution before somewhere better was found. Who knew, back then? So here I am, standing outside the Multiplex…looking down the street. Did I tell you I’m slightly pissed? I look up. Yes, the tower block that housed SUB and Multiplex is an ugly structure, and completely out of keeping for Leiden’s new ambitions (a world city no less). And it’s slap bang next to the station. I can imagine thousands of office workers and business types thinking, ‘what an eyesore’. And in fairness it is. But, as Uncle Monty famously said, there is no true beauty without decay. And its ugliness is now familiar, funny, and – given the fact that SUB and Multiplex played host to over a thousand bands and artists – quietly heroic. Someone should make a plaque when they stick the shiny new building up. 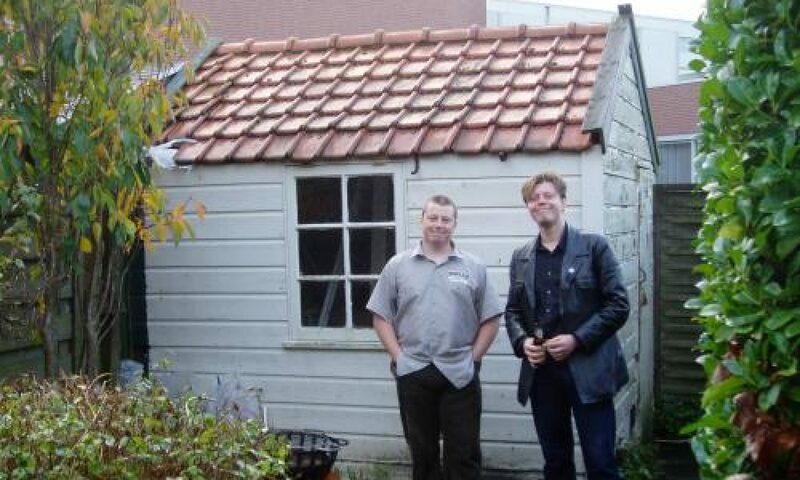 ‘You probably don’t know it, but this is where “greatest rock and roll bike shed in the world” was.’ It’s a fittingly useless gesture to a beautiful, unplanned, bottom up project run by music lovers that touched thousands of people around the world. Do better, Leiden council. What’s that, you can’t?